In 1991, Mama Cash moved to her current office in the Eerste Helmersstraat 17. There were three rooms. The room housing the office manager also served as a meeting room, wardrobe, storage and kitchen. The amount of work grew, as did the number of grant requests, and slowly Mama Cash hired more paid staff members. While in 1991 there were only two part-timers, by 1995 there were five. Their task was to support the founders of Mama Cash and a dedicated group of volunteers and advisors. Making grants to women’s organisations in the Global South started to require more attention and specialised knowledge. In 1991, the Fund for the Global South was spun off from the Culture Fund, and moving forward the Culture Fund would only accept grant requests from the Netherlands. Also in 1991, the Culture Fund set up the annual Mama Cash Art Award. From 1994 onward, the financial statements were audited by an accountant. 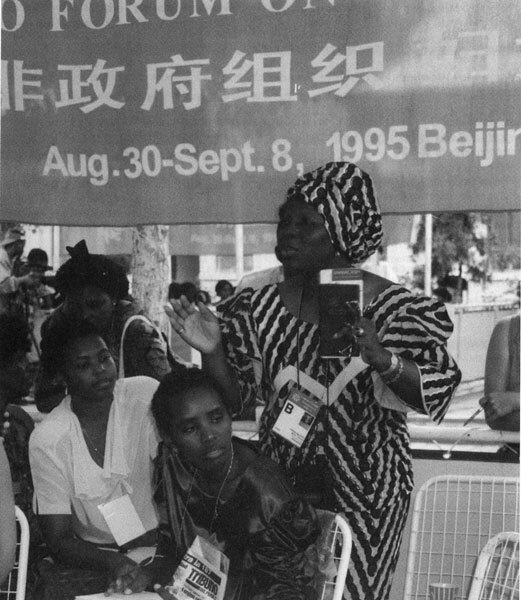 In 1995, Mama Cash got an internet connection, which facilitated communication, especially with women’s movements in the Global South. Mama Cash also set up her first website. In celebration of her tenth anniversary, Mama Cash organised a party and a raffle. The first ticket was sold to Hedy d’Ancona, Minister of Welfare, Health, and Culture. For two months, employees, Board members and volunteers travelled the country to sell tickets. The proceeds were considerably more than expected: over 8,500 tickets were sold for an amount of 105,000 guilders (50,000 euros). On November 19th 1993, Mama Cash celebrated her 10-year anniversary. The theme of the celebration was ‘In Mama Cash’s shoes for one night’. Five women’s initiatives made presentations to the 700 guests attending the celebrations. Upon arrival, each guest received tokens. With these, they could support the projects and new entrepreneurs represented. After spending their initial tokens, guests had the option to purchase more in support of the initiatives. ‘Mor Cati’, the first women’s shelter in Istanbul, turned out to be the general favourite and left with over 7500 guilders (3600 euros). The festivities ended with performances by Dutch singer Mathilde Santing and Yulduz Usmanova and her swinging band from Uzbekistan. Because of financial cuts by the Dutch government, a growing number of social organisations were forced to find other financial resources. As Mama Cash was one of the first organisations in the women’s movement to start fundraising, her expertise was frequently solicited. Through workshops, she passed on her knowledge to other women’s organisations. Over 25,000 women from all over the world gathered for the Forum of the Fourth UN World Conference on Women in Beijing in 1995. Western women were in the minority compared to the impressive number of women from Africa, Asia, Latin America and Eastern Europe. It was the Global South that had clearly become the centre and inspiration of the women’s movement. Mama Cash was represented by six women, and she had given 39 travel grants so that women from the Global South could attend the conference. The conference’s final document declared that women have the right to decide about their own sexuality, including their reproductive health, and they have the right to live free from discrimination and violence. Also the right of inheritance of women and girls was recognised. Mama Cash organised a well-attended workshop in the Beijing Conference about her activities. During this workshop, her role as a funder was discussed. Women from Africa accused the West of imposing a western capitalist model of development on them. Mama Cash agreed with this view and declared that she was particularly supporting autonomous groups engaged in contributing to radical social change. Furthermore, several American women’s funds had organised a meeting about the necessity for an independent money flow through independent women’s funds to women’s rights organisations. 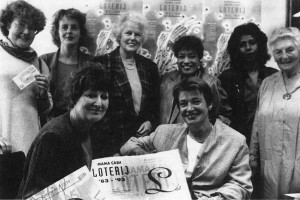 Semillas, a women’s fund in Mexico, had already launched in 1991. Women in other parts of the world had also started to set up their own women’s funds. Mama Cash wholeheartedly supported these initiatives. 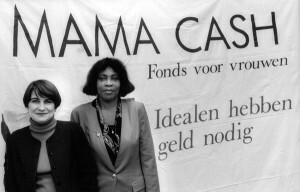 During the period 1991 – 1995 Mama Cash granted 846,000 euro to 711 groups. In 1996, 17 volunteers and 7 part-time staff worked for Mama Cash.